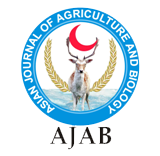 Asian J Agri & Biol. 2018;6(4):587-593. The availability of microalgae (phytoplankton) has an important role in aquaculture. Nannochloropsis sp. is a microalgae that can be used as the live feed for larvae cultivation of shrimp, fish and shellfish. In this study, a Nannochloropsis sp. isolate obtained from Lampung Mangrove Center waters was cultured by using combination of agricultural fertilizer as a substitute for pro analyze fertilizer (Conway). The aims of this research were to investigate the cell density (cell/L), the growth rate of cell, and doubling time of isolates Nannochloropsis sp. from the waters of Lampung Mangrove Center, which were cultured intermediately with the volume of 100 L. This research was designed using completely randomized design (CRD), with 5 treatments of agricultural fertilizer consisted of A: Urea 40, ZA 20, TSP 5 ppm, B: Urea 40, ZA 20, TSP 10 ppm, C: Urea 40, ZA 20, TSP 15 ppm, D: Urea 40, ZA 20, TSP 20 ppm, and E: Conway and vitamin B12 1 ppm (control), with 4 replications. The results showed that the treatment of A produced the highest cell density and the fastest growth rate (p <0.050) compared with the others. In addition, the treatment of A showed the fastest doubling time significantly (p <0.050) to B, D, and E treatments, but it is not in significant difference with the treatment of C (p=0.065). It was concluded that the combination of the agricultural fertilizer treatment A was the best for growth rate of Nannochloropsis sp. in intermediate culture. Creative Commons Attribution 3.0 License.